(My Jewish Learning via JTA) – Yom Kippur, the Jewish Day of Atonement, starts at sundown on Tuesday, Sept. 18. Traditionally one of the most somber days on the Jewish calendar, it’s known for fasting and repentance – not to mention killer caffeine withdrawal headaches. However, the holiday has some lesser-known associations as well. Jews historically have been popular scapegoats — blamed for an array of ills not of their creation. But, and we’re not kid-ding, they really do deserve blame (or credit) for the term scapegoat. In Leviticus 16:8 (in the Torah portion Achrei Mot), the High Priest is instructed on Yom Kippur to lay his hands upon a goat while confessing the sins of the entire community — and then to throw the animal off a cliff. 2. 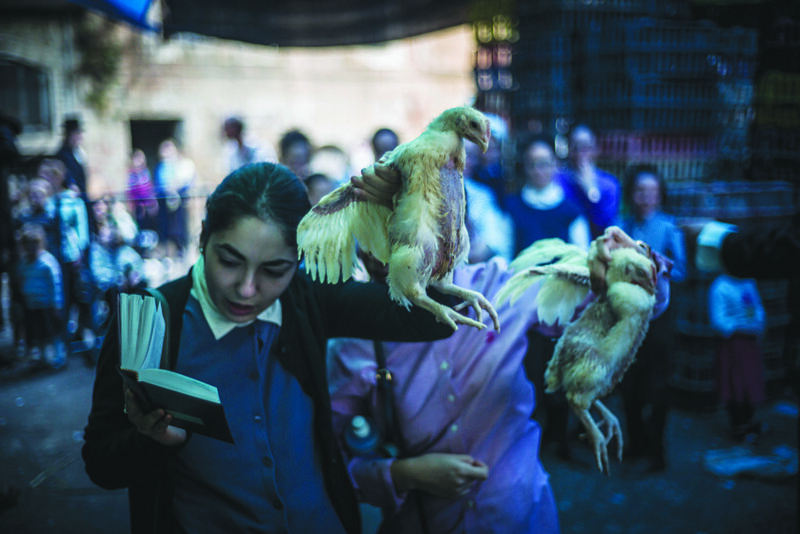 Another animal ritual, swinging a chicken around one’s head, has sparked considerable controversy, and not just from animal-rights activists. In 2015, the kapparot ritual, in which a chicken is symbolically invested with a person’s sins and then slaughtered, spurred two lawsuits in the United States: one by traditional Jews claiming their right to perform it was being abridged by the government and another by animal-rights activists. Centuries earlier, the ritual drew criticism from notable sages like the Ramban (13th century) and Rabbi Joseph Caro (16th century), whose objections had less to do with animal welfare than with religious integrity. The Talmud states that both Yom Kippur and Tu b’Av (often described as the Jewish Valentine’s Day) were the most joyous days of the year, when women would wear white gowns and dance in the vineyards chanting “Young man, lift up your eyes and see what you choose for yourself. Do not set your eyes on beauty, but set your eyes on a good family.” Given the aforementioned caffeine headaches and the difficulty of making a decision on an empty stomach, we’re glad this particular tradition is no more. Other traditional no-nos on Yom Kippur include bathing, wearing perfume or lotions, having sexual relations and wearing leather shoes. The less-than-attractive aroma resulting from the first two restrictions (not to mention the romantic restrictions imposed by the third) may explain why the day ceased to be an occasion for finding true love. 5. In Israel, Yom Kippur is the most bike-friendly day of the year. Although many Israelis are secular, and there is no law on the books forbidding driving on Yom Kippur, virtually all the country’s Jews avoid their cars on this day. With only the occasional emergency vehicle on the road, bikers of all ages can be seen pedaling, even on major highways. 6. Eating a big meal before the holiday begins will make your fast harder rather than easier. Traditionally, the meal eaten before beginning the fast is supposed to be large and festive, following the Talmudic dictum that it is a mitzvah (commandment) to eat on the eve of Yom Kippur, just as it is a mitzvah to fast on Yom Kippur itself. However, eating extra food — particularly in one last-minute feast — does not help to keep you going for 24 hours, says Dr. Tzvi Dwolatzky of Israel’s Rambam Health Care Campus. He suggests eating small amounts of carbohydrates (bread, potato, rice, pasta), some protein (fish, chicken) and fruit. 7. On Yom Kippur in 1940, London’s Jews kept calm and carried on. 8. Yom Kippur’s Kol Nidre services are the only night of the entire Jewish calendar when a prayer shawl is worn for evening prayers. According to the late Rabbi Louis Jacobs, the tallit (prayer shawl) is worn during Kol Nidre as “a token of special reverence for the holy day.” It is traditional to wear a tallit or a white garment for the entire holiday, with the color white symbolizing both our spiritual purity and our removing ourselves from the vanities of the material world. Many people actually wear a white robe called a kittel. 9. A Virginia rabbi’s pro-civil rights movement sermon on Yom Kippur in 1958 riled up local segregationists and sparked fears of an anti-Semitic backlash.